Euoplocephalus tutus is the newest addition to this series that sparked the imagination of dinosaur hunters everywhere when it was first introduced in 2007. This large armadillo-like creature lived in Alberta between 76 and 70 million years ago. Its body was covered with bony armour embedded in its skin. Even its eyelids were covered with moving bony plates and its tail had a defensive club that was formed by four bony growths fused together. Although such extensive body armour might have given this dinosaur a fierce appearance, it was actually a slow, awkward-moving herbivore that fed on low-lying vegetation. A selective aging effect creates a powerful impression of fossilized bones in stone. In fact, this technique ensures no two coins are exactly alike. 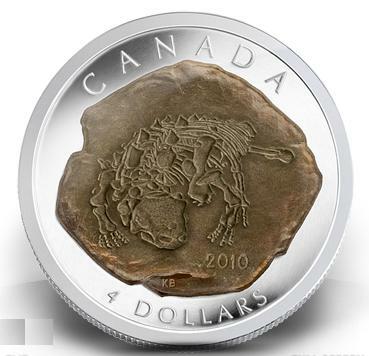 Each 99.99% pure silver coin is unique and—with a design that was developed in close collaboration with palaeontologists at Alberta’s Royal Tyrell Museum—is an original and compelling keepsake of one of humanity’s great fascinations. A Euoplocephalus fossil with its distinctive armour-like appearance.